The Honolulu International Airport (HNL) on the Island of Oahu was first known as John Rodgers Airport when it was originally opened in 1927 and was actually the first full-service public airport in Hawaii. Much of the current airport is actually outdoors. Get a no-obligation reservation today. 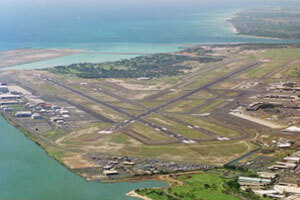 After exiting your plane in Oahu you will enter the passenger terminal of the Honolulu airport. After claiming your baggage proceed to the car rental company booths on either side of the baggage claim area. Fill out your rental agreement and you will be directed to go outside where you will catch the rental car shuttle bus. 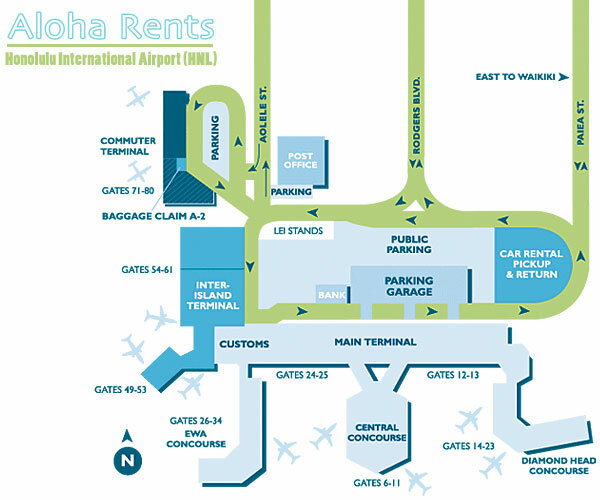 For drivers who will return to the airport to pick up friends and family that arrive on later flights, be sure to take advantage of the free Cell Phone Lots available at Honolulu International Airport. If you are using Thrifty you do not need to check-in at the airport. Simply hop on the shuttle for rental car pick-ups. The ride only takes 5-10 minutes (3147 Nimitz Highway) and the shuttle runs every 5 minutes. Renting off-site from Thrifty no longer saves you extra money due to the fact that concession fees are now charged at all locations. We have been offering discount car rental in Honolulu for over ten years. Visit our Oahu rates page or get a rental car reservation now.